(Nanowerk News) Two robots equipped with instruments designed to “listen” for the calls of baleen whales detected nine endangered North Atlantic right whales in the Gulf of Maine last month. The robots reported the detections to shore-based researchers within hours of hearing the whales (i.e., in real time), demonstrating a new and powerful tool for managing interactions between whales and human activities. The team of researchers, led by Woods Hole Oceanographic Institution (WHOI) scientists Mark Baumgartner and Dave Fratantoni, reported their sightings to NOAA, the federal agency responsible for enforcing the Marine Mammal Protection Act. NOAA Fisheries Service, in turn, put in place on Dec. 5 a “dynamic management area,” asking mariners to voluntarily slow their vessel speed to avoid striking the animals. The project employed ocean-going robots called gliders equipped with a digital acoustic monitoring (DMON) instrument and specialized software allowing the vehicle to detect and classify calls from four species of baleen whales – sei, fin, humpback, and right whales. The gliders’s real-time communication capabilities alerted scientists to the presence of whales in the research area, in the first successful use of technology to report detections of several species of baleen whales from autonomous vehicles. 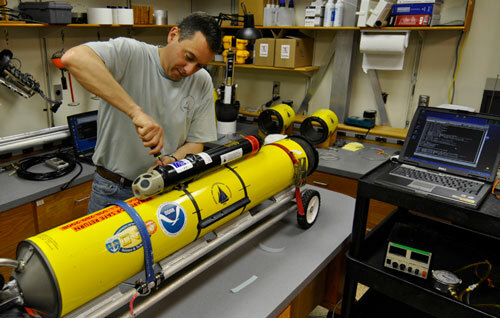 The gliders are operated by Dave Fratantoni, a scientist in the WHOI Physical Oceanography Department. In use by oceanographers for about a decade, gliders move up, down, and laterally in a sawtooth pattern through the water by changing their buoyancy and using their wings to provide lift. They are battery powered and exceptionally quiet -- a critical feature when collecting acoustic data. The oceanographic research project was underway from Nov. 12 through Dec. 5, operating in an area called the Outer Fall, about sixty miles south of Bar Harbor, Me., and 90 miles northeast of Portsmouth, NH. Right whales are thought to use this area every year between November and January as a mating ground. Using the gliders’s reconnaissance data and continued real-time updates, the science team was able to locate whales in just a few hours of searching. “We found our first right whale on the first day that we were surveying in decent weather conditions because the gliders were up there doing the leg work for us, to tell us where the animals were in real time,” says Baumgartner. The innovative whale detection system provides conservation managers with a cost-effective alternative to ship- or plane-based means of identifying the presence of whales, and gives whale ecologists new tools for understanding large animals that spend most of their lives out of human eyesight below the sea surface. Whale researchers want to learn what draws whales to this part of the ocean during the late fall and winter. However, high winds and rough seas typical of that time of year make studying the animals very difficult. “This presents a huge knowledge gap,” says Baumgartner. The labor-intensive work of surveying for whales, overseen by NOAA, is usually done by human observers on ships or airplanes, and is limited by the conditions at sea. The success of the project is a result of years of productive collaboration among engineers, biologists and physical oceanographers at WHOI, scientists at the NEFSC Protected Species Branch in Woods Hole, and federal funders like the Office of Naval Research and NOAA’s Applied Science and Technology Working Group Program. The gliders are operated by Fratantoni, a physical oceanographer; the DMON acoustic monitoring instrument was developed by WHOI engineers Mark Johnson and Tom Hurst; and Baumgartner, who has nearly a decade of experience identifying whale calls, wrote software for the DMON to enable it to recognize unique calls of sei, fin, humpback, and right whales, and to keep a tally of when and where it heard each call. By integrating the DMON into Fratantoni’s gliders, the team had the ability to search large areas of the ocean and to receive data in real time. “No one of us could've done this project alone. But by teaming up, we created a really nice group of people with expertise that was tailor made for this problem,” says Baumgartner. “Now, we can know that there's an animal in a particular part of the ocean within hours of a call being made, as opposed to months later,” when the instruments have finally been retrieved and the data has been reviewed. Gliders – approx. six-foot-long, torpedo-shaped autonomous vehicles with short wings – have been in use by oceanographers for about a decade. They move up, down, and laterally in a sawtooth pattern through the water by changing their buoyancy and using their wings to provide lift. Battery powered and exceptionally quiet in the water, the gliders are equipped with an underwater microphone on the underside of the vehicle near its wings, and an iridium satellite antenna on the tail section. The vehicle surfaces every few hours to get a GPS position and transmit data to shore-side computers. In addition to demonstrating the utility of the robots for the management and conservation of baleen whales, the project also has ongoing scientific objectives. One goal of the shipboard research team, in addition to spotting the whales, was to take measurements and collect biological samples of the tiny crustaceans or zooplankton upon which the whales feed, in an effort to characterize the oceanic conditions and to understand how those conditions impact the whale’s food and ultimately attracts whales to the study area. “Untangling how that happens is a big deal,” says Fratantoni. “We wanted to figure out what right whales were feeding on in this area,” says Baumgartner. “We took profiles of the temperature and the salinity of the water and sampled zooplankton throughout the water column to understand what might make this area attractive to right whales.” Analysis of these data is in progress now. Additional team members included representatives from the New England Aquarium who maintain a catalog of right whales and are experts in identifying individual right whales from patches of thickened skin on their heads, called callosities. Through their efforts, the team recognized four of the individual whales sighted during their week on the research ship -- two males born in 2006, one male born in 2004, and one female born in 2008.